I hope everyone had a wonderful and safe Independence Day! It was the best 4th of July of my whole life, and hands-down the best day Joshua’s ever had period. I want to share some photos but will be doing that tomorrow. Today I have a simple crockpot meal that is great any time of year, because in summer, it doesn’t heat the kitchen, and in winter, it’s just nice to have something hot and ready at the end of a cold day. I got this recipe from my friend, Holly, who actually had posted it in response to a mutual friend’s request for crockpot recipes on Facebook. 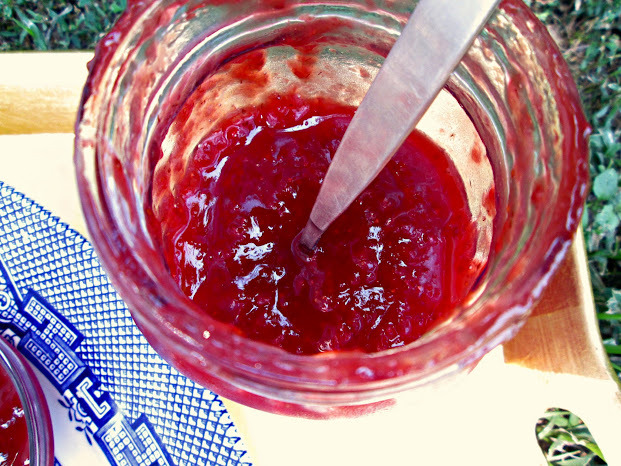 I nabbed it and made it soon after because I’d just made my own apricot jam. These were very satisfying and tasty. Hope you enjoy, and stay cool! 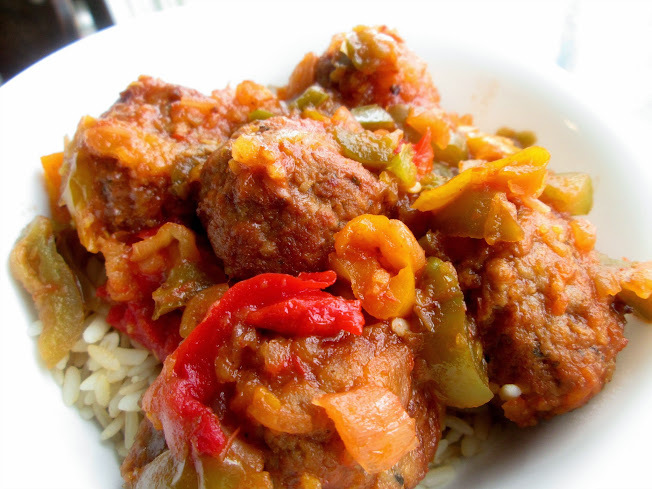 Place the meatballs in the bottom of your slow cooker and layer the bell peppers over, if you’re using them. 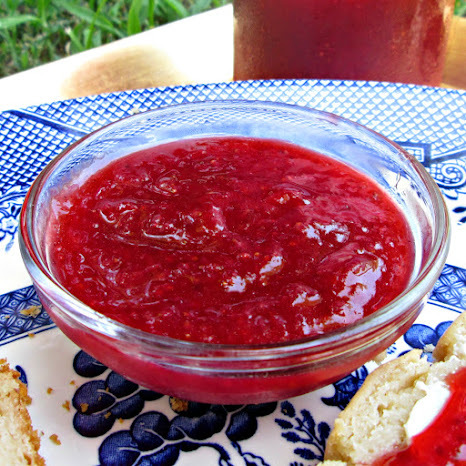 Whisk the salsa and apricot preserves together in a bowl, and pour over the top. Cover and cook on low until heated through, 6-8 hours. Holly suggests serving over rice or with mashed potatoes and green beans. 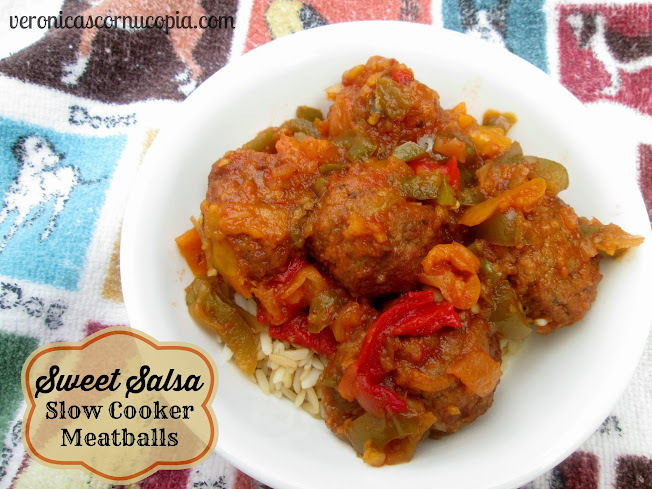 Recipe source: adapted from Holly W.
Posted in Meats, Slow-Cooker/Crockpot and tagged apricot preserves, crockpot, easy, fall, meatballs, peppers, recipe, salsa, simple, slow cooker, spring, summer, sweet, winter. Bookmark the permalink. Dennis is a huge fan of blackened meat. And by blackened, I don’t meant burnt (that would be me that likes burnt meat), I mean meat that’s been rubbed with spicy blackening seasoning. 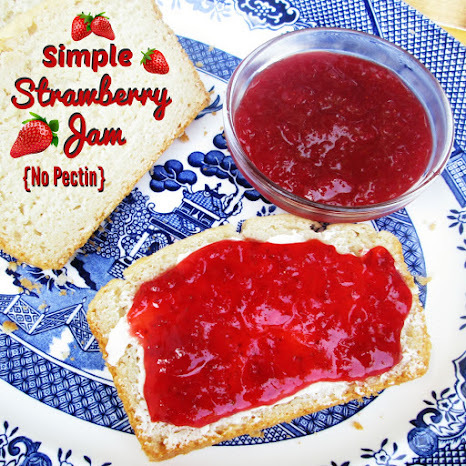 So when I ran across this recipe, I knew it would be perfect for Father’s Day. 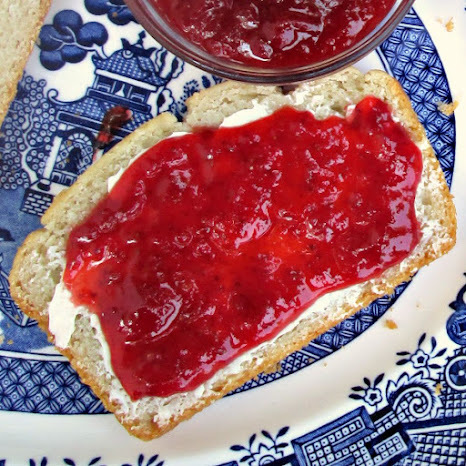 It was perfectly suited for him, is impressive, but simple to prepare, which is pretty much a requirement for all the recipes I make these days. It was incredibly delicious, and I would make it again, and again, and again. Drizzle olive oil over chicken breasts to lightly coat. Sprinkle blackening seasoning liberally over both sides of the chicken. Heat skillet on medium-high and cook chicken 3 minutes on each side. While chicken is cooking, heat Alfredo sauce and roasted garlic. Add pasta and toss; divide between two dishes. 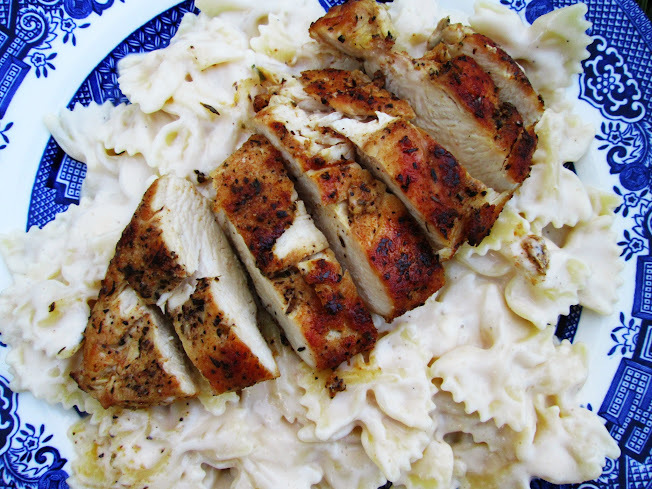 Slice chicken and place on top of pasta. Sprinkle with Parmesan cheese, if desired. Veronica’s notes: In a pinch, you can sprinkle in some garlic powder to taste instead of the roasted garlic. Also, Bertolli’s jarred light alfredo works great for this recipe if you can’t find the fresh stuff. Here’s the card I made for Dennis this year. It may be my favorite card I’ve ever made. 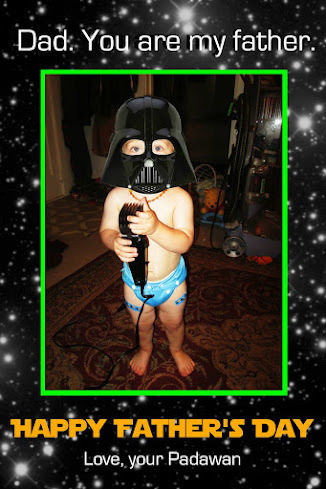 :) He loved it! 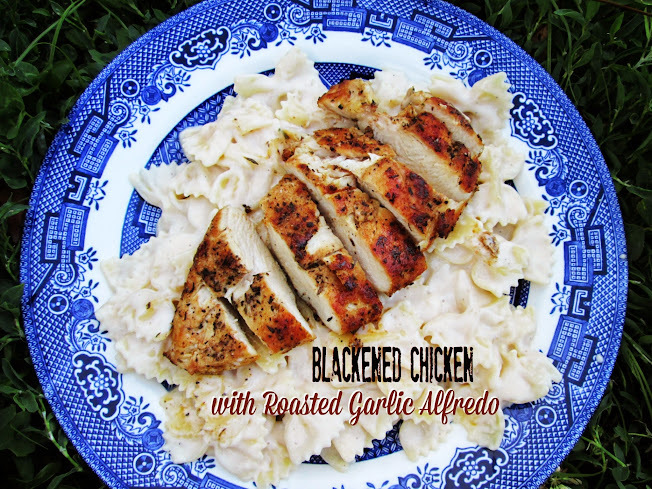 Posted in Meats, Pasta and tagged alfredo, blackened chicken, blackening seasoning, Cajun, dinner, easy, father's day, Louisiana, recipe, roasted garlic, simple, special occasion, spicy, Valentine's Day. Bookmark the permalink. Preheat oven to 400F. Place butter in 9″ X 13″ baking dish and place in oven while it’s preheating. Once butter is melted, you can remove the pan to continue with the recipe, or let it cook a little to brown it and add an extra dimension of flavor. Be sure to watch it if you decide to let it brown because it can go from nutty to burnt pretty quickly. Remove pan from the oven and sprinkle prepared chicken over the top of the butter. In a medium bowl, whisk together milk, flour, baking powder and salt. Pour over the chicken, but do not stir. In same bowl, after scraping out as much flour mixture as possible, whisk together chicken broth and cream of chicken soup. Pour that over top of casserole; do not stir. Bake uncovered for 35 – 45 minutes. When done, the top will be beautifully browned and bubbly around the edges. Veronica’s notes: I boiled a whole chicken for this recipe. It was about 5 lbs and I covered it with water in a stock pot and added a teaspoon of salt, boiling for an hour or two. I forgot to set the timer so I really don’t know how long I boiled it because I was so busy with the baby- lol. If you make it this way, it’s very economical, and you automatically make your own broth to use in the recipe. Posted in Meats and tagged casserole, chicken and dumpling, chicken and dumplings, comfort food, easy, fast, quick, recipe, simple, winter. Bookmark the permalink. Anyway, this recipe is a lot different from the one I made growing up, but my recipe was little more than ground beef mixed with tons and tons of garlic powder, salt and pepper, rolled up and cooked in a skillet before being added to a pot of pasta with Ragù sauce on it. I will always love meatballs made that way because that’s how I ate them growing up and have a fondness for it, but honestly these are better, the best I’ve had, actually, and I love the cooking method. You don’t have to cook them separately, you just plunk them into the sauce and let it simmer away! So simple. It also makes the meatballs more tender and moist to cook them this way, and the flavor of the sauce and the meatballs both benefit from cooking slowly together. 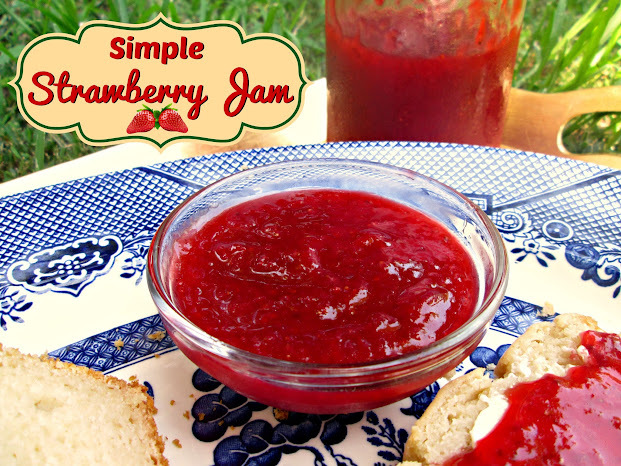 The sauce is a very simple recipe and so, so good. The amount of black pepper gives it a bit of a spicy kick so I’d cut it by half if you don’t like heat. This is now my go-to spaghetti sauce (I’ve made it twice in the last week) and I hope you’ll give it a try! Remove ground beef from the fridge to allow it to come to room temperature while the sauce cooks. Heat the olive oil in a large stock pot over medium heat. Swirl to coat the bottom of the pan to coat. Add the onion and garlic and saute, stirring occasionally, until browned, about 7 minutes. Lower the heat if they begin to burn. The more color that develops on the onion and garlic, the more flavor they’ll add to the finished sauce. Once the onions and garlic are tender and caramel in color, add the crushed tomatoes and the tomato paste and stir until the mixture is smooth and well combined. Add the remaining sauce ingredients (oregano through pepper), stir, and bring the mixture to a simmer. Reduce the heat to the lowest setting, cover the pot, and let cook for 30 minutes, stirring occasionally so that the bottom does not burn. Make the meatballs: Lightly beat the egg in a large mixing bowl. Break apart the beef as best you can into the bowl and add the remaining ingredients. Use your hands to mix together until well incorporated, trying not to overmix, which could render your meatballs more tough. Shape the meat mixture into 12 balls (I always get 13), each about 1 ½ inches in diameter. Drop them into the sauce, stir gently so that they’re all covered in sauce. It might look like there’s only enough sauce for the meatballs and there won’t be enough for pasta, especially if you’re like me and love your sauce, but trust me, there’s enough. Let them cook, covered, for about 1 1/2 hours over low heat, stirring occasionally to prevent burning. Once the meatballs are done, cook your spaghetti to al dente according to the package directions, drain, pile some onto plates, and top with sauce and meatballs. Veronica’s Notes: your tomatoes matter. I bought very cheap tomato puree (and tomato paste, for that matter) from Aldi that was excellent but found that Walmart’s brand, which is higher in price, was horrible by comparison. Buy good tomatoes or you won’t have good sauce. Also, the original recipe used mint in the meatballs instead of parsley and I just wanted to mention that in case you’d like to try it. 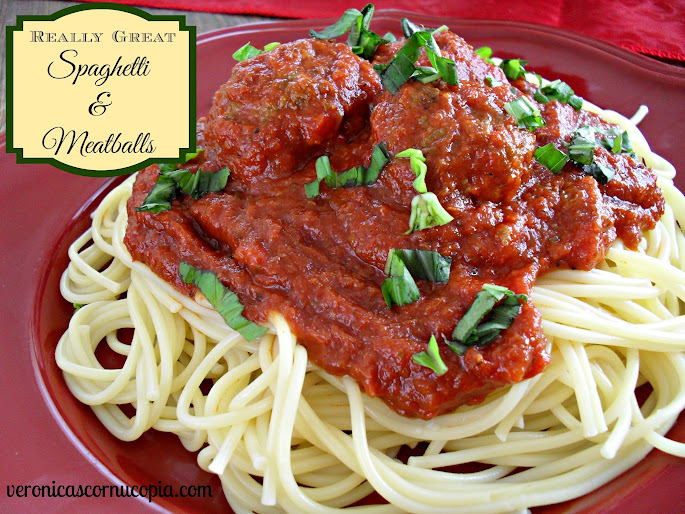 Posted in Pasta and tagged best, dinner, great, meatballs, recipe, romantic, simple, spaghetti, spaghetti and meatballs, Valentine's Day. Bookmark the permalink.